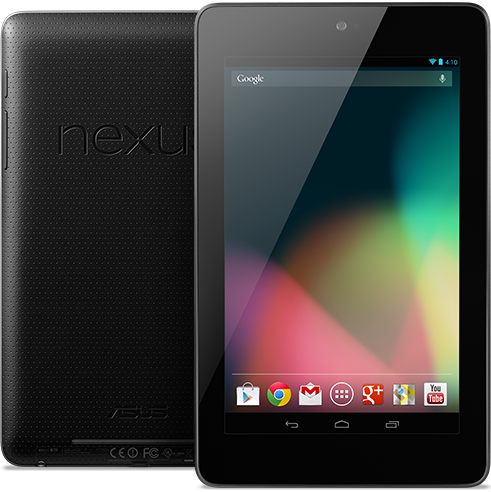 Google has come out with the new Nexus 7 Tablet that is manufactured by Asus on their behalf. It runs the latest Android 4.1.1 Jelly Bean mobile operating system that makes it one of the most efficient tablets in today’s market, available at a very affordable price. So today in our post we are going to Review of Google Nexus 7 Tablet with Official Features, Specs & Price Details. The Google Nexus 7 sports a 7-inch screen display that is scratch proof because of the Fit Glass from Corning. This tablet is one of the best choices for busy people who are constantly on the move. The LCD screen ensures that the images on screen are stunning and a pleasure to view. This is further enhanced by the 1280 X 800 resolution with an impressive pixel density of 216 ppi that gives a very sharp output with text that is easy to read. The screen can be used outdoors as comfortably as it can be indoors (thanks to the backlit in-plane) as the screen adjusts to the lighting outdoors. One can comfortably give lengthy presentations, holding the laptop in one hand, while the other is busy at the controls or gesturing, thanks to the rubberized back panel that gives you a firm grip. As far as the specifications go, the Google Nexus 7 is quite excellent. The nVidia Tegra (three quad-core processor) that powers it has an impressive random access memory of 1 Gigabyte, much like the others in this class, like the Eee Pad Transformer Prime. The features that are unique to this breed of tablets like pinch-to-zoom and swipe-to-navigate are pretty smooth and easy to use, thanks to Butter, the Google’s interface. These features place the Google Nexus in the league of Apple’s iOS, as there is hardly any noticeable lag and the menu transitions are certainly better. You will not have any connectivity issues as the Nexus is Bluetooth enabled, that lets you use the keyboard and headsets you already have. One thing that the Nexus lacks is 3G, which could be a problem for business people wanting to browse. The Nexus, though is fully Google integrated, and owners can utilize the related services like Chrome, Google+, Calendar, Google Maps as well as Gmail. Chrome is set as the default browser, with options to change if desired. Video conferencing will not be a problem as there is the front-facing camera with a built-in microphone that is quite sensitive. The sturdy 16 Wh battery is what people on the move will love as it can go on for a good 10 hours before it needs to be charged. The keyboard has predictive capabilities and a pleasure to type in, and is perfect for fast, flawless typing. The personal assistant (something like Siri) Google Now is handy and can be used for browsing your recent history, get the exact GPS positions, and keep yourself updated about pending appointments and have all travel information at your fingertips. Overall, what surprises everyone is how Google is able to offer such high-end stuff, without compromising on quality, and yet keep the price affordable enough for a majority of the people. A fully functional Android tablet at such low prices will certainly make its mark in the markets. Users can also Root Android 4.1 Jelly Bean On Google Nexus 7 and Unlock Bootloader & ClockworkMod Recovery with our Tutorial and Guideline available here.